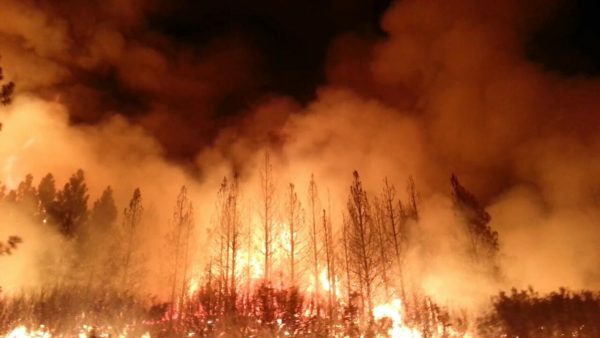 The Rim Fire in the Stanislaus National Forest near in California began on Aug. 17, 2013 and is under investigation. The fire has consumed approximately 149, 780 acres and is 15% contained. U.S. Forest Service photo. Addressing climate change costs money, but wildfires gobbling up our country — and seas swallowing up our shores — costs more. All of that is nothing compared to what a friend went through last summer in Montana. She and her family (including a toddler) were cooped up in their home for ages, trying to avoid inhaling the smoke. She had to install air filters in an attempt to keep at least the indoor air clean. We’re going to end up spending money either way: whether we pay to develop non-polluting energy sources, restore forests, and take other steps to prevent catastrophic climate change, or we don’t, and then we have to pay for the consequences. —OtherWords columnist Jill Richardson is pursuing a Ph.D. in sociology at the University of Wisconsin-Madison. She lives in San Diego. Distributed by OtherWords.org.